The surreptitiously obtained CNN video that we reported two weeks ago that portrayed slave auctions in Libya have continued to have political repercussions in Europe and Africa, with political leaders expressing how shocked, shocked they are that these auctions are still going on after they had supposedly ended in the 1800s with the abolition of slavery in many countries around the world. CNN obtained the video using concealed cameras at a slave auction just outside Tripoli, the capital city of Libya. In one case, the auctioneer says, "Does anybody need a digger? This is a digger, a big strong man, he'll dig. What am I bid, what am I bid?" The man is auctioned off for $400-800. The video about the slave trade and slave auctions triggered large sometimes violent protests in front of Libya's embassy in Paris. As it happens, an African Union - European Union (AU-EU) summit was already scheduled to take place in Côte d'Ivoire on November 29-30. The summit brought together more than 80 leaders from countries on both continents to discuss such subjects as investments in Africa, trade, and provided humanitarian aid, with a particular emphasis on investing in youth. However, the intended agenda was hijacked by the slave trade issue. It's estimated that 400,000 to 700,000 migrants are trapped in Libya, having travelled there in the hope of reaching Europe. Instead, they've been put into refugee camps, in compliance with an agreement that Italy made with many Libyan warlords and governments to prevent them from traveling to Europe. But the refugee camps have been filled to overflowing, and the excess tens or hundreds of thousands of migrants and refugees are being auctioned off as slaves. Nigeria's president Muhammadu Buhari said, "Some Nigerians were sold like goats for a few dollars in Libya." "Libya is a country at war, despite the semblance of peace. A black person is seen as merchandise, he is sold like chicken. Migrants on their way to Libya are kidnapped. They are kidnapped when they are walking and sold for as little as 300 Libyan Dinars (216 USD)." "Do not take the Libyan route, it’s not a good idea and you definitely won’t like what you will find. You will meet people who, I don’t even know how to qualify them, but those Arabs – and I am speaking from experience since I have in different parts of Maghreb region, but those Arabs are not people who should live on earth." "It’s very important that we simply support Africans to put a stop to illegal migration, so people don’t have to either suffer in horrible camps in Libya or are even being traded." 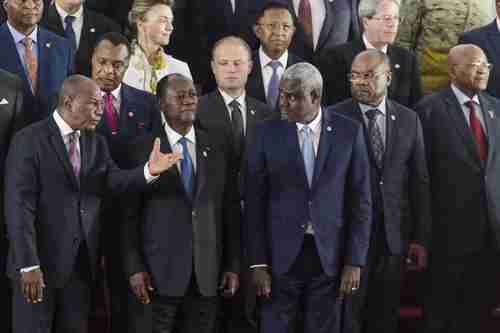 "The current slave auctions of Africans in Libya are not only gross and scandalous abuses of human rights, but are also mockeries of the alleged solidarity of African nations grouped in the African Union (AU), of which Libya is a member. I continue to be puzzled as to the vehemence with which so-called social democrats oppose or attempt to undermine measures designed to address poverty. Their demagoguery and opportunism will always be exposed." The outrage expressed by these African leaders is pretty phony, since the slave auctions had been reported for a long time. The CNN video, however, triggered the large anti-slavery protests, especially in Paris. After expressing universal outrage about the slave trade and slave auctions, the national leaders proceeded to offer a "solution" which has no chance of doing anything to solve the problem. The objective of the AU-EU summit agreement is that all 400,000-700,000 migrants that are trapped in Libya are to be sent back to their countries of origin. So, for example, 3,800 migrants in just one of the dozens of camps in Tripoli alone will be sent back to their home countries immediately -- assuming that their home countries will take them. Some 250 migrants from Cameroon have already been returned home. speed up the resettlement of those in need of international protection. It's obvious that this task force will do little more than hold meetings and express outrage. With 400,000-700,000 migrants trapped in Libya, the slave trade and slave auctions will continue as before. With huge migrant flows destabilizing many parts of the world, it's interesting that a related story is going on in China's capital, Beijing. 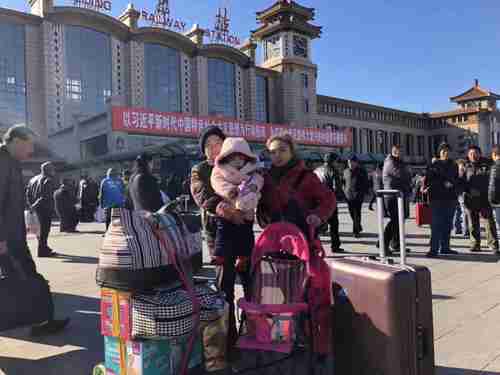 After a shantytown fire on November 18 killed 19 people, the Chinese Communist Party (CCP) is using the fire as an opportunity to evict thousands of Beijing migrants from their homes, and to demolish their homes. Many of these people have lived in these homes for 10-20 years. They migrated to Beijing years ago, and they were laborers who built Beijing into the huge metropolis that it is today. The evictions are being called "cruel" even among the usually obedient and compliant Chinese, because they're given only a few hours or a couple of days to collect their belongings and move somewhere else -- and for most there's really nowhere else to go to escape the winter cold.